These sign frames can enhance your graphic exposure. 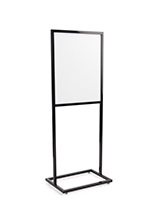 These display holders, sign frames are made from quality metal with a pewter gray finish. The neutral finish of the frames adds elegance to your store decor. 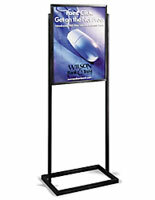 These sign frames are effective marketing tools for use in high-traffic, indoor areas. 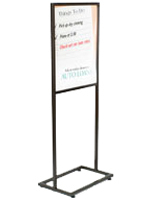 Sign frames, also known as metal stands, are ideal for advertising in lobbies, store fronts, restaurants and bookstores. 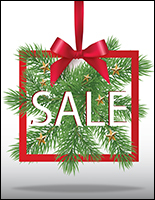 These sign frames are the most cost-effective way to showcase your posters. 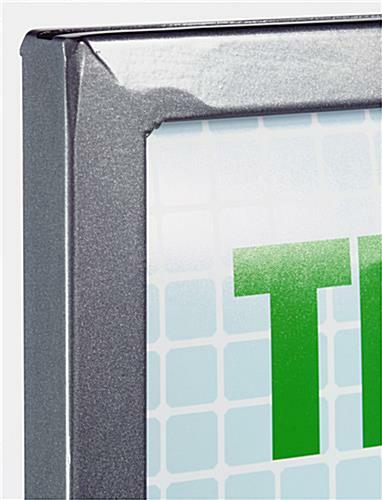 The sign frames can be double-sided, maximizing your graphic exposure. 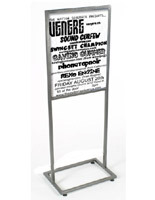 These sign display holders feature a top-loading design, great for fast graphic changes. When printing your graphics, we recommend the use of thicker poster materials, as we do not include the sign frames with plastic lenses or backers. Unlike our MFPH1BLK series (see related products below), posters are held in place only by the grooves in the frame. The graphic slot measures ¼" deep. We do, however, include the sign frames with 4 adjustable levelers for use on uneven floors. The poster stands are shipped unassembled, but are easily assembled with minimal effort. The tools necessary for assembly are included as well. 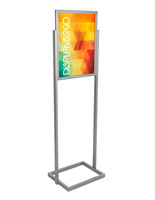 We absolutely love these poster stands! 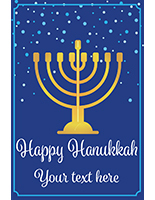 They provide a way to display signs within our many communities and can hold there own in a simple or elegant setting. We love that you love them, Angie! Thanks for the great review! We frequently have special events in our building. Because these are light and easy to use, these sign holders have been great for posting information through out the facilities.